Not only can the center not hold, but there is no center to begin with...The story mostly speeds along at an obnoxious rate and pitch, the better to misdirect from the next dumb abracadabra plot twist, but good luck hanging in for over two hours of it. 129 min. Lionsgate. Director: Jon M. Chu. Cast: Jesse Eisenberg, Mark Ruffalo, Woody Harrelson, Dave Franco, Lizzy Caplan, Daniel Radcliffe, Morgan Freeman, Michael Caine, Sanaa Lathan. The NOW That’s What I Call Music! anthology CD series is now up to volume 58 of pop hits, which makes me wonder why all movies aren’t titled like this week’s Hollywood sequel Now You See Me 2. It’s a title that evokes magic, but also comprises a command: you will see this latest product…2! Except that you really don’t have to. Not much has changed in the world of Now You See Me. Though director Louis Letterier has been replaced by Jon M. Chu, the brief remains the same: “Ocean’s 11 with magicians.” Big stars, jazzy music, a lot of flash, almost no dazzle. The plot defies description—in fact, I wager half the cast couldn’t explain it to you—but again concerns the supposedly Robin Hood-esque band of magicians calling themselves “The Horsemen.” Persistently slipping from the grasp of law enforcement, they expose or rob from the rich and sprinkle a bit on the poor on their way out. The sequel shifts Mark Ruffalo’s character, FBI double-agent Dylan Rhodes, to center stage, but this remains an ensemble property, featuring Jesse Eisenberg as self-styled ringleader J. Daniel Atlas, Woody Harrelson as hypnotist Merritt McKinney (and, this time, his twin brother! ), Dave Franco as slight-of-hand whiz Jack Wilder and, filling a void left by Isla Fisher, Lizzy Caplan as sassy illusionist Lula. Magic debunker Thaddeus Bradley (Morgan Freeman) is still in the picture, as is treacherous tycoon Arthur Tressler (Michael Caine), not to mention Sanaa Lathan as Rhodes’ FBI colleague and Daniel Radcliffe as a dorky rival to the Horsemen. Admittedly, that’s a lot of acting talent to throw at a picture, and it’s the reason to see the redundant Now You See Me 2, if any (who doesn’t want to see Ruffalo get his Jackie Chan on for three minutes?). Because the rest is pointless sound and fury: not only can the center not hold, but there is no center to begin with. While carrying out deeply unrealistic scams, the characters behave stupidly in a far-from-airtight plot, and it doesn’t help that the heroes are smug criminals sticking it to even worse criminals. The story mostly speeds along at an obnoxious rate and pitch, the better to misdirect from the next dumb abracadabra plot twist, but good luck hanging in for over two hours of it. The largest problem still facing this franchise is that magic on screen can’t impress us in the least when do-anything CGI is so plentiful. Erstwhile star of magic TV specials David Copperfield has been brought on as co-producer and consultant to attempt to combat this problem, but to little effect (there’s one sorta snazzy illusion to introduce Caplan). Mostly, the best Now You See Me 2 has to offer regarding magic are dumb epigrams like “Seeing is believing, but is it truth?” Thank you, Morgan Freeman. Can we go home now? 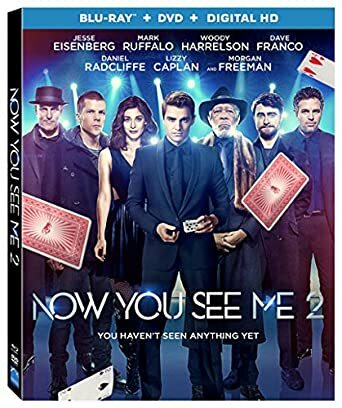 Lionsgate makes Now You See Me 2 "appear" on home video in a Blu-ray + DVD + Digital HD special edition. Picture quality is faithful to the filmmaker's intent, the digital-to-digital transfer offering a good-looking if unexcitingly typical home-video experience. Strong detail and fine textures put the image's best foot forward, but accurate color is also a plus. Black level, shadow detail, and contrast are the picture's iffiest areas: none are terribly damaging to the PQ, but the deficit of deep blacks does detract from the viewing experience. The lossless Dolby Atmos mix, by way of TrueHD 7.1, mightily impresses in the audio department, to a reference-quality T. It's a thunderous mix, pleasingly assaultive in the big moments and precisely discrete in the separation and placement of effects throughout the soundscape to bring home the theatrical experience of total immersion. In bonus features, Lionsgate offers a thorough audio commentary with director Jon M. Chu, now keeper of the franchise, as well as three featurettes amounting to nearly an hour of behind-the-scenes B-roll footage and cast and crew interviews. The titles basically tell the tale of each segment's focus: "The Art of the Ensemble" (21:11, HD) covers cast and characters, "You Can't Look Away" (17:14, HD) focuses on visual components, and "Bringing Magic to Life" (16:09, HD) waxes enthusiastic about the franchise's central theme, in conception and execution. All site content © 2000-2019 Peter Canavese. Page generated at 04/20/2019 07:51:40PM.